In Jesper Cook’s recent article, “Miter Angles and Miter Saws,” Cook points out that miter saws aren’t designed for finish carpenters. I believe the same can be said for miter saw stands. There have been countless articles, reviews and tips written and videoed on the ideal miter saw stand (for example: Lamar Horton’s “Wooden Miter Saw Stand” and Gary Katz’s “Make a Miter Saw Work Station“). And while not everyone agrees on what’s “perfect,” most trim carpenters would agree that continuous material support is critical. Continuous support provides needed stability to long runs of molding, makes material easier to handle, acts as a clamping surface for other tasks such as coping, and, most importantly, allows for more accurate cuts. I’ve botched too many cuts on trim that wasn’t seated quite right. Cutting trim that’s not flush to the base and table, or out of square to the fence, can cause joints to be way off. In addition to continuous support, a must-have for me is mobility. I need to be able to move my equipment around my worksite without having to break everything down and put it back together again. I also can’t stand making unnecessary trips hauling equipment around when a more efficient way to transport and set up is readily available—it’s inefficient, aggravating, and costs me time and money. I’ve looked at pretty much every commercially made miter saw stand on the market, and with the exception of Festool’s UG-Kapex wheeled stand, which is designed to fit the Kapex (see photo, right), I’ve never found a wheeled stand with true continuous material support. In fact, the only non-wheeled stand currently produced with continuous support that will fit the saws I own is FastCap’s Best Fence. Of all the wheeled stands out there, Bosch’s T4B has always stood out to me. It’s simple, doesn’t take much to break down, and works with most SCMS saws. After mounting the saw to the T4B, I really liked the ease of set up, the tool-less expansion rail adjustments for material support, and the fact that it was mobile. One nice thing about the T4B is that there are no legs for the extensions. This allows you to move the entire stand around with the supports extended. Just like it is, this stand is perfect for cutting dimensional lumber. However, without continuous support, it’s virtually useless for trim work…at least pleasant trim work. The 5312 and other Bosch saws have on-board base extensions used to support work pieces near the saw’s base. When pushed all the way in, the tops of the extensions rest on ledges machined into the base. The extensions move in and out on rods running under the saw on rails. The extensions are locked in position with clamping levers. To add continuous support to the T4B, I built wings out of 3/4-in. birch plywood and wrapped the edges in 3/4-in. maple. I made each wing 11 1/2 in. wide and 58 in. long, giving me over 11 feet of support. I used the ledges of the base as a place to rest the wing, the same ledge that the extension base slides over. To do this, I had to completely remove the sliding base extensions. I secured the wings to the base using the rods from the extension base. They were easily removed by loosening some set screws. To join the rods to the wings, I nailed and glued two pieces of plywood together and pocket-hole screwed them to the underside of the wings. I then drilled two holes through the doubled-up plywood as a place to run the rods through. As a grip to move the rods in and out of the rails, I made some wooden knobs, drilled them to accept the rods, and placed a set screw through each knob to hold the rods to the knobs. I use the saw’s clamping levers to lock the rods to the base. It makes for a really secure connection. The far ends of the wings rest on the T4B’s work height support. This also makes it easy to put together and take apart. Taking the wings apart and putting them back takes about 30 seconds. It’s very simple, doesn’t have too many bells and whistles, and works great for my needs. It also makes for a nice worktable. Even with the wings on, I can still move the saw around when needed. And when I need extra support for coping or planing, I use a FastCap Upperhand underneath one of the wings. Chris Knighton‘s interest in carpentry started as a young boy, working with his father building fences, gates, and sheds at their family home. Years later, Chris spent some time working with a seasoned carpenter, learning to build porches and decks. His real interest is in finish work, but that didn’t come until being forced to renovate his own home. Though not currently in the profession, Chris’ passion for finish work has fueled a constant study and learning process. Recently, Chris has learned to design built-ins, mantlepieces, and other projects using SketchUp. Chris, his wife, and their four children live in Northwest Louisiana. Nice job chris. I actually just did a similar build for my dewalt stand. Thanks Sal! If you get time, take a photo of your stand I’d like to see it. I also have the dewalt miter saw stand and I modified it as well I will up load a couple of pics later. it is still a work in progress but would gladly take any feedback on improvements. Here are a couple of pics of my Dewalt miter saw set up. I built it a while ago and I stare at it looking for better ways to improve it. Mine may not be as refined as Chris’ but it does do the trick. Great stand! I have the kapex & UG stand and love it but your bosch base is much more functional for other saws. I may look at this rig for a future saw. Nice article too! Good job on the mods to the stand. I’ve the Bosch TS2000 stand (for my Bosch portable table saw), which uses the same Gravity-Rise feature that’s on your T4B. Couldn’t ask for an easier way to cart my saw to and from job sites or around the shop. I’d sure love to have your setup in addition to this one! One day I hope? I have that same stand and love it! However, like the T4B it’s missing material support, i.e., out feed and left side. Bosch makes extensions but they are severely lacking. I’ve considered doing some mods to the stand and add solid support. Maybe for another article? Where exactly did it say- “Cook points out that miter saws aren’t designed for finish carpenters”?? While he said THAT and I agree to a point! (depending on education and experience) I think you are misleading us to make a point! I truly feel that any woodworker with a brain could figure it out even through trial and error. I have and will continue to use my miter saw for fine woodwork including compound angles. I don’t expect a scale marked in degrees to be accurate to 1/100 OR 1/10 of a degree and am capable of compensating for the crudity of such, I just make a couple of test cuts first. (I also did an initial check and adjustment of my miter saw!) Anyone that cannot do that cannot expect perfect cuts! It isn’t the equipment so much as it is the skill and execution! You’re correct, Jesper never specifically said miter saws weren’t designed for finish carpentry (I didn’t quote him saying that), however, I believe one could make that inference based upon a miter saw’s miter gauge not being designed for finish work. I can’t see how anything has been misleading? While understanding how to apply miter gauges when roof framing vs finish work isn’t necessarily high level mathematics it can certainly be confusing to some. I’m sure there are fine carpenters out there that get the correct angles all the time but have never thought about the mechanics of it much. Jesper’s article just explains it, that’s all. I don’t know who ever has ever suggested not using a miter saw for finish work? Dezri, not Derzi…sorry about that! I think Dezri Dean makes a very valid point about the misleading nature of Chris’s opening statement and is worth following up on. I don’t think it was intentional; perhaps an overzealousness in striving for continuity with a prior TIC article ??? (just a guess). To be clear, I believe miter saws ARE primarily designed and intended for finish carpenters. If not, what aspect of construction would they be intended for? I also believe miter saw stands ARE designed and intended to support miter saws (and therefore are designed for finish carpenters) to which their name refers. Again, what else would they be intended to be designed for? Further, I think the crux of this issue centers around the holy grail search for each individuals perfect miter saw set up. That problem is going to be defined differently by each carpenter’ unique budget, transportation, site, and work limitations/ demands. Those are the core reasons why there are so many design options being marketed to us; someone is always going to be able to design a better mouse trap at different price points. I believe Chris would have been on less controversial ground by opening with something similar to his statement: “(sic) while not everyone agrees on what’s “perfect,” most trim carpenters would agree that continuous material support is critical” He does a great job supporting this thesis with regard to the Bosch T4B. I really appreciate Chris taking the time to show us how well he achieved his particular goal with this moderately priced, widely adaptable, and commercially available model. Thanks Chris! Very nice, simple practical and not expensive. kapex & UG is a very nice set up but $2,000 is toooo much for my wallet right now. I too would love to have the Kapex and UG! The old “Chop Saw Stand” has always been a hassle. I think all the latest little stands are designed just to drain your wallet. Look how much you have to fiddle with them just to make them functional, they would not hold up to framing. I probably will stick with the old 2×12 or floor joist modified to flush out with the saw and some saw horses, until I can build the one I have designed in my head. Which will be a lighter, accurate, efficient and professional setup. My stand would need to be able to withstand multiple units worth of heavy framing stock, then roll into siding, usually pretty fine cedar soffit and siding work, and then go inside and knock out some nice tight finish work. Then the next job, hopefully, and repeat. Good to see guys who care and try. Nice work and excellent details. I’m in the process of upgrading my miter saw. This info will be very useful. Please pardon my soap-boxing, and keep up the creativity! Thanks for writing this. I recently purchased a new Bosch 12″ saw with gravity rise stand and this is the first accessory I made for it. I used the same dimensions as you gave. I used hanger bolts in place of the carriage bolts you used and all-thread couplers for the knobs (I plan on getting the Rockler knobs you used later). I had to rout a few notches in the underside of the wings to avoid interference with the saw in a couple of places. 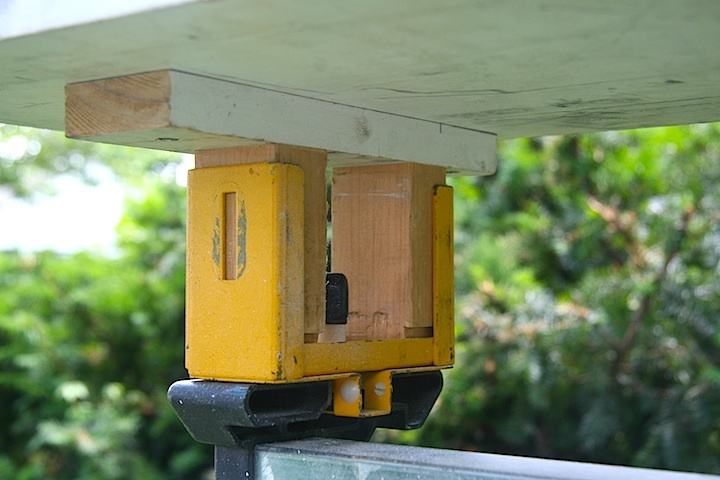 I plan on adding an extension fence and flip stops… and maybe some undermount cubbies to hold some quick clamps. Again, thanks for writing this and thanks to TIC for posting it. Thanks for the comment. I’m glad you found the article useful. I still use my setup everyday and unless I plan to move it with the wings attached, I rarely use the rockler knob or even the rods. I just let the carriage bolt hold it in place. Within a few months after this article was published, I saw that FastCap added wings for the Bosch stand to their “Best Fence” lineup. I wondered if this article might have encouraged their development? Thanks again for the comment as you will most certainly appreciate the continous support the wings give you. I have already a basic miter saw stand last month. Can you please tell me the difference between a gravity rise miter stand and basic miter saw stand. Excellent mod, Chris. I wish I had seen it before I bought a Best Fence. Would have saved some money. I love my T4B but I came across a forum where a person asked if he could cut 7 inches off a 16 foot 2×12 with that stand (15′-5″ to one side of the blade) without additional support. A Bosch rep answered that he could. Makes you wonder where Bosch gets their employees.